That was the beginning of a collaborative career between Lili and Boogie; she’s been drawing him in everything from humorous cartoons to educational materials ever since. Lili worked with the late Dr. Sophia Yin to create several posters on dog behavior. 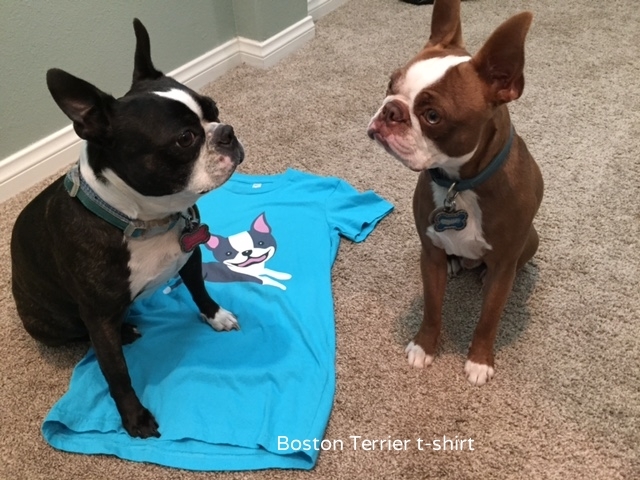 Last year, she and Jill Breitner collaborated on Dog Decoder, an app that provides dog owners with a comprehensive glossary to interpret the body language of their dogs.We’ve written about Lili and Boogie on Dogster, as well. 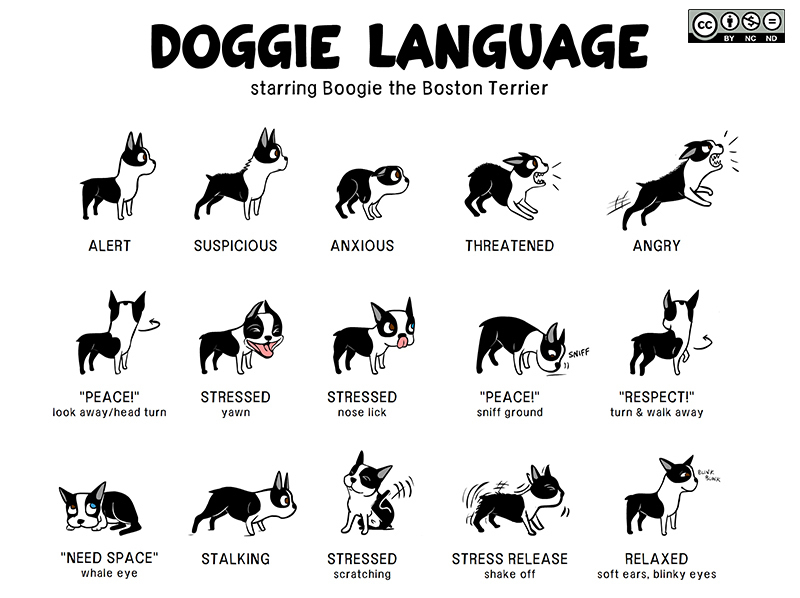 A clip from the “Doggie Language” poster that went viral in 2011. The full work is available under a Creative Commons license at Lili Chin’s website. Recently, the story of Boogie’s modeling career took a different turn when Lili announced that she was filing suit against Kohl’s department store and clothing manufacturer K. Bell for using her sketches of Boogie on T-shirts and socks without permission. According to Lili, this isn’t the first time that she’s had her work used without permission. On the contrary, it’s happened scores of times, and usually, she’s able to settle it pretty easily. 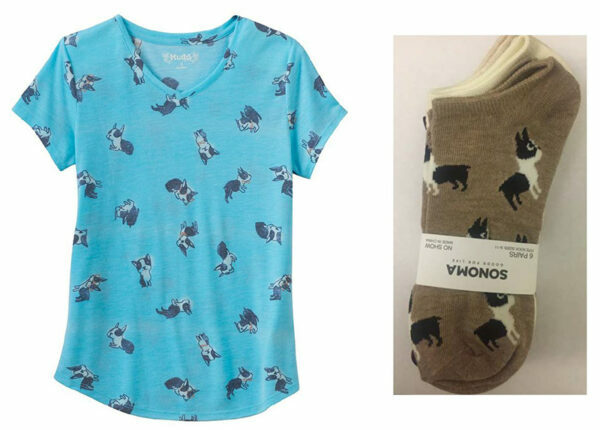 One of Kohl’s shirts and a pair of socks, from Lili Chin’s complaint filed against Kohl’s. The internet has been a very mixed blessing for those of us who make our livings — or try to — through creative work. It’s easier than ever before to get your work seen by millions of people; writers, photographers, and artists can build and interact with communities of fans without having to deal with the old-fashioned gatekeepers of agents, gallery owners, and editors that ruled media in the 19th and 20th centuries. But it’s also a lot harder to get paid for your work. Writers and artists are routinely encouraged to work for “exposure,” instead of the cold, hard cash that will pay our rent, groceries, and medical bills. The Huffington Post, one of the biggest news sites on the internet, is infamous for expecting writers to work for free. Even if you get paid for the work you do, there are a lot of people who think that if it’s on the internet, it’s public property. That’s why instead of drawing new pictures of Boogie, a big part of Lili’s job is tracking down unlicensed uses of her work, and then sending out cease and desist letters. The original Boogie with one of the T-shirts Lili Chin sells. Kohl’s decision to lawyer up and fight back at Lili is more than a little surprising. Even if we’re completely fastidious and note that Kohl’s is only guilty of an “alleged” infraction, when you put the original poster next to a picture of the the T-shirt that Kohl’s has been selling, it’s damning at first glance. Kohl’s lawyers may think that they can build a case that the T-shirt design wasn’t derived from Lili’s work, but it’s hard to imagine how. I for one would be very curious to see how. But no matter how the case goes, the fact that it’s happened at all should be instructional to all of us. Creative work is work, and the people who do it deserve to get paid for it. Unfortunately, people who wouldn’t think of shoplifting a beer from the local grocery store have little problem with swiping someone’s words or pictures off the internet for their own project. Those who love Lili’s depictions of dogs owe it to her to respect that work and make sure she’s compensated for it. How do you do that? Well, the most inexpensive and convenient way is simply to respect the Creative Commons License that’s on so much of her work. The specific terms that Lili publishes under are Attribution, Noncommercial, and No Derivatives. That means if using, you have to say that the work belongs to her, you can’t make money off it, and you can only republish it in its original form. If Kohl’s is found to have violated Lili’s copyright, they would have violated all three clauses of that license. If you’ve got some money, she sells shirts and other items on her site; she even does custom portraits. Contrary to the common image of artists freezing in the garret until they die of consumption, most creative people actually love having money for food and rent. 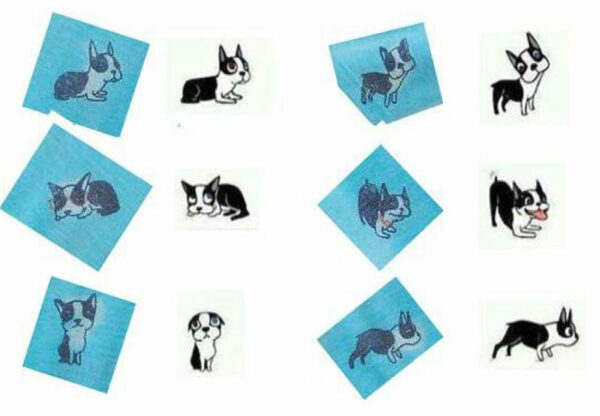 Details from the shirt above, next to Chin’s images of Boogie, from Lili Chin’s lawsuit. For those who think that Lili’s pictures are adorable and just want to share them around, that’s easy to do, too. Her Flickr page and personal website each make high-resolution images available under the previously mentioned Creative Commons license. As long as you’re not using it for a commercial project, changing it, and are willing to give her credit, you’re free to download it and pass it around as you please. You can also follow Lili and show your support on her Doggie Drawings Facebook page. You can also tell the store how you feel on Kohl’s Facebook page. The lawsuit may be between Lili Chin and Kohl’s, but it also shows a larger responsibility that we all have to artists on the internet. If we want them to be generous with their art, we have to do our best to make sure that they thrive. That means respecting their right to make a living off their work and being willing to pay for it when appropriate. It is, apparently, a lesson that Kohl’s could stand to learn. The post Here’s How You Can Support Doggie Drawings Artist Lili Chin, Who Is Suing Kohl’s Department Store appeared first on Dogster.